The MACNA 2015 Website is now live and early-bird registration is available! 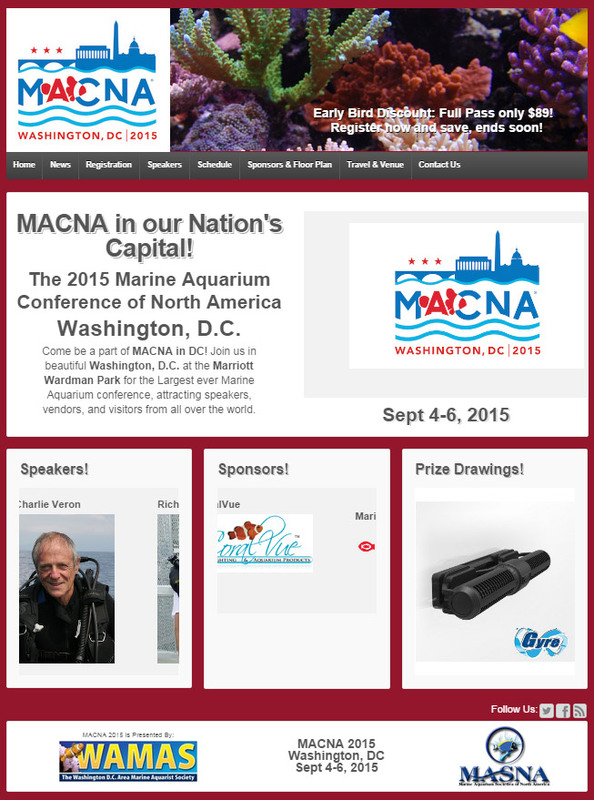 The Washington DC Area Marine Aquarist Society (WAMAS) is excited to announce that MACNA® 2015 (the Marine Aquarium Conference of North America) will take place on September 4th, 5th, and 6th of 2015 at the Washington Marriott Wardman Park Hotel, in northwest Washington, DC. MACNA is in its 27th year and is the oldest and largest marine aquarium conference in North America. With its historic museums and monuments, and home to the three branches of our government, DC offers a dynamic backdrop that is second to none. A crossroads of history, culture and contemporary style, DC inspires like no other destination and makes MACNA’s return to DC a fantastic choice. For more details please visit our website at www.macna2015.org. MACNA is proudly sponsored by: United Pet Group/Marineland, CoralVue, Neptune Systems, Fluval, EcoTech Marine, AquaIllumination, ReefSavvy/NextReef, Two Little Fishies, Reef Nutrition, Drs. Foster & Smith/LiveAquaria, Ecoxotic, and eShopps. WAMAS is a registered 501(c)(3) non-profit educational organization dedicated to supporting the local aquarium hobby through educational outreach, fostering new hobbyists, and furthering the advancement of captive bred marine ornamentals.